Sport-ober, more commonly known as October, is the absolute best time of year. Temperatures are cooling off and layered clothing is coming back in style. As a larger-than-average size guy myself, I love it. Overweight folk like myself look better in jackets, coats, and sweatshirts were the size of our, uh- table muscle (aka the belly) can be disguised. Not to mention the fact that we are naturally warmer people. When the girls are cold at the game they want to cuddle with us or borrow our sweatshirts to keep warm. They may be using us for our body heat, but so what; we’re using them too. I digress…this time of year truly rocks because the month of October is the sports fan’s dream. Football season is in high gear with the NFL season starting to hit stride and the college season really heating up as well. Baseball’s postseason has begun with the World Series starting by the end of the month. Hockey fans rejoice as their favorite teams take the ice to begin the regular season. Basketball fans begin to gravitate to their favorite NBA teams as the preseason tips off in early October with the regular season beginning on the 27th. There is more to this wonderful month than the NFL, NBA, NHL, and MLB. NASCAR gets closer to crowning its champion as the Chase for the Sprint Cup heats up with the fourth, fifth, sixth, and seventh races (of ten) held during the month. By time the checkered flag drops at the Martinsville Speedway on October 25 the top competitors will undoubtedly be pulling away from the pack. IRL fans will see their champion crowned earlier in the month (Mr. Ashley Judd otherwise known as Dario Franchitti won). Yes, October is a month where it is good to be a guy. Sorry honey, but the to-do list will have to wait. The game is on. During Sport-ober it is only fitting that a beer that is also in tune with the time of year be consumed while Tiger Woods does his thing, Shaq and Lebron run the courts in Cleveland, George Steinbrenner buys another World Series and the fast cars of NASCAR and the IRL go vroom. Many brewers make an Oktoberfest style beer, something only available during the fall months. 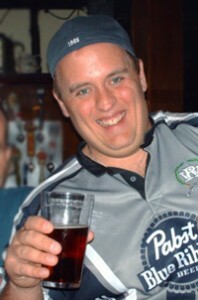 One of my personal favorites is from the good people of the Flying Dog Brewery in Maryland. 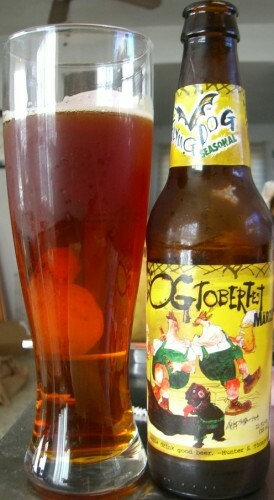 Dogtoberfest is the Flying Dog version of an Oktoberfest beer. This amber colored beer comes with a nice, creamy head. Heavier on the malt than hops this beer goes down smooth with the sweet taste of caramel to please the palate. It does have a bit of an aftertaste, but the excellent flavor totally makes up for it. At 5.3 % ABV this brew will not keep you from remembering how bad your team folded in the bottom of the ninth, but it will definitely soften the blow.